Drunken Man Bites Shih Tzu In The Face And Rips Out Dog’s Eye. 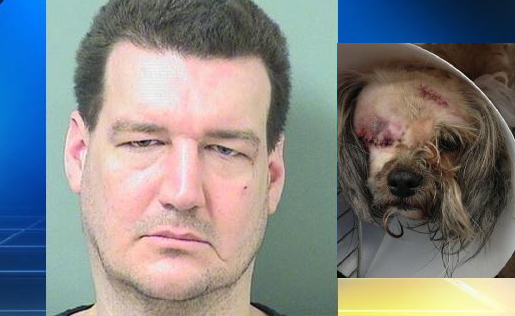 A South Florida man is facing an animal cruelty charge after he bit a small dog in the face, seriously injuring its eye, the Palm Beach County Sheriff’s office said. Deputies were called to Lake Worth animal hospital early Friday morning and found a Shih Tzu names Cujo with his eye hanging out of the socket. The dog’s owner told deputies that her son, David Etzel, 36, had been drinking and teasing the dog, prompting the dog to bite Etzel. She said Etzel then bit the dog back. A veterinarian told deputies the injuries were comparable to being hit by a vehicle or attacked by another dog. Deputies later found Etzel asleep at his home. He told them he would never hurt the dog. Etzel Is being held on a $10,000 bond.